I attended the "Tag You Are It" session at NTC by Ami Dar and Katrin Verclas and was exposed to a lot of new technology tools. So, I set up a little action learning project (cambodia4kids) to play with these tools to see how they might be useful for technology infused curriculum or nonprofit use. So, there have been a few things on my action learning list (I'm going to create a 43 things list for this at some point). Just when I was beginning to feel totally overwhelmed, I decided to dive and not worry about any logical or instructional order! One of the tools that was mentioned was RSS readers. RSS stands for Really Stupid Syndication and since I'm really stupid I took a trip to Marnie Webb's article 10 Reasons Why Nonprofits Should Use RSS and Andy Carvin's What's RSS and Why Should I Care About It?. Both of these articles are excellent primers on the topic. More importantly, they gave me enough incentive to start reading blogs and also had some simple 1-2-3 advice for selecting a RSS reader. With Bernie Dodge's glowing recommendation of Bloglines, I set up an account. So I added the three blogs that I had been reading by clicking through them regularly from links I put on my own blog which I had thought was pretty cool. Now, with the RSS reader I can just click to one place and see if there are any updates. Hey, this will definitely reduce my RSI injuries and save me some time! Bernie Dodge: The links on his blog labeled as "Feeds I Reads"
Is the blog content of interest to me for my npo/ed tech work or Cambodia work or personal reasons? Did reading this entry make me want to explore the entire blog to evaluate it further?Who is author? What is their expertise/background? What is the content of the blog? Do they micro specialize or cover several topics? Do they have good links and other resources included in their blog? Are they a good writer? Do they regularly post to their blog? If this leads to me wanting to return to the blog on a regular basis, I add to my bloglines account. I also have some questions about to best organize my collection, but I think this will come as I use it more. I looking at it like my browser bookmark and I like to organize things into folders. And, I'd like to make those folders consists with the link lists and categories on my blog. Before I go on about this interesting artist/social activist project, I found it in the blogsphere ... I've been experimenting with cambodia4kids.org blog to test out the instructions/advice I'm reading on various npotech sites about blogs. My own little action learning project. Cameras for Cambodia (C4C) is a grassroots project that will take place in the town of Siem Reap, Cambodia. The project was developed by Elizabeth Briel, an American artist and photographer, who will be based in Siem Reap as of June, 2005. C4C will put cameras in the hands of children aged 10-16. These are difficult ages in any society, but many of these kids will face pressure to quit school and work to support their families. Girls are particularly likely to leave school at a young age. C4C will teach them basic photo techniques, pay for developing and enlargements, and hold exhibitions in Cambodia, the US and Paris (summer/fall 2006), and beyond. Profits from sales of their work will go towards their education: even public schools in Cambodia charge desperately poor families fees to keep teachers on staff for an entire school day. If the family cannot afford the fee, the child goes home. The project will begin with 5 students, and expand up to ten as the project grows. A university-aged Khmer assistant with an interest in photography will also be recruited. Elizabeth is seeking donations of cameras and photo books before she departs for Cambodia in mid-June. She will take your old, your plastic, your unwanted, even your point-and-shoot 35mm cameras as long as they work! She is also seeking photo books. The project is similar to one sponsored by Global-Children where they gave cameras to children in orphanages. The organization also sponsors the dance and music program at Kampong Speu Orphanage where my daughter lived for 18 months. Getting Started, Blogging Tools and What Makes A Successful Blogger? Marnie Webb recently posted an excellent primer on selecting a blogging tool called "So you want get started blogging?" I was in the process of pulling together this information for an afterschool program at ctc and a few others. I was hoping there was something very straightforward and easy to understand about the tool selection and I stumbled upon it. Talk about blogging as a source of discovery ... I was on the digital divide network trying to figure out how to make my RSS feed from here go to the DDN blog - and clicked on "read other blogs" and there it was! The Gateway to Educational Materials is a Consortium effort to provide educators with quick and easy access to thousands of educational resources found on various federal, state, university, non-profit, and commercial Internet sites. I used it while I was searching for lesson plans for the cluster workshop on Cambodian Culture I'm teaching for K-2 and it turned up resources that I hadn't seen before. The search engine uses a structured funnel approach. You type in your key words, but on the side you see other ways you can drill down. Step 3: Further narrowed by elementary school and lesson plans. Now have 5 or so adaptable ideas. ClockLink.com provides analog and digital clocks that you can easily embed in your web page with any time zone of the world. 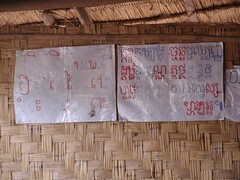 I can answer the question "What time is it in Cambodia?" without missing a beat. This could be an interesting resource for teaching time zones for social studies or math teachers ... The world clock site made it easy to figure out what time zone Phnom Penh, Cambodia (GMT + 7:00). Then all I had to do was edit the script and paste it in to my post. Now, I'm all set to let people who visit Cambodia4kids know what time it is in Cambodia! Edupodder is a site dedicated to exploring how podcasting can be used in education. Dr. Suess explains why computers crash. Ruby Senreich of Lotus Media just posted her excellent presentation "Network-Centric Advocacy" that she gave to participants in the Open Society Institute’s “Connect US” initiative. It provides some theory and practice on social networks and technology tools used to implement an effective grassroots movement for change. Doing research right now to develop a simple blogging project as an afterschool project for grades 3-5. There is an interesting conversation going on in the nonprofit technology community about the benefits and barriers to blogging in the nonprofit organization setting. Here's a snippet of the parrall conversation in the educational tech world from Mark Wagner's "Educational Technology and Life" blog. This particular post even includes a podcast! Digging deeper into links and material in this post, there is a link to a mattrix by Scott Leslie on blogs use in formal education. I will be leading several workshops called "Exploring Cambodian Culture" at the Sage School (preK-8 school for gifted students) during "Cluster Week." Cluster Week concept is based on Joseph Renzulli’s Triad Model of learning for gifted students where students participate in a variety of workshops that emphasize higher-order thinking skills, providing opportunities for creative and productive applications of these skills to real-world situations. CultureQuests allow students to examine, understand, and appreciate diverse cultures, including the student's own culture. These inquiry-based projects are rooted in student questions and interests, and involve the focused, intensive study of one or more aspects of the literature, art, music, history, religion, language, daily life, customs, and traditions of other cultures. A CultureQuest is undertaken by an entire class working together, within which small groups of students focus on areas of the culture that are of particular interest to them. A secondary goal of a CultureQuest is to provide students with the technology skills they will need for the 21st century. I have a lot more reading and digesting to do, but for starters I wonder what the difference is between a Culturequest and Webquest? I'm working with a newly established community technology center that is housed in an after-school program on an instructional technology plan for lab. One area we're looking at is digital video, so have been madly reviewing educational resources and options. I found a great resource, http://www.schoolhousevideo.org/ which had exactly what I was searching for - a piece on strategies for multi-level projects. 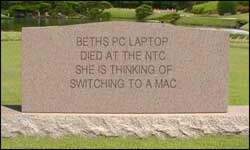 My laptop died last week in Chicago at the NTC. So, it was a bit difficult for me to find anything to laugh about. I couldn't find anything amusing for my favorite holiday, April Fool's Day and was just going to reference what I wrote on April 1, 2003. Found some inspiration on my favorite blog at the Tombstone Generator.